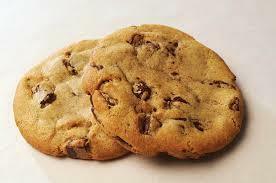 Did you know that May 15th is National Chocolate Chip Cookie Day? I didn't. Not until Krusteaz brought it to my attention with their delicious Triple Chocolate Chunk Cookie Mix. Krusteaz Bakery Style Triple Chocolate Chunk Cookie Mix makes chewy and delicious cookies just like the ones you’d find at a corner bakery. If you’re a chocolate lover you’ll love these cookies! My Experience: My family loves chocolate chip cookies. I have a couple of recipes that I have used, but nothing beats Krusteaz mixes for convenience, ease and taste! 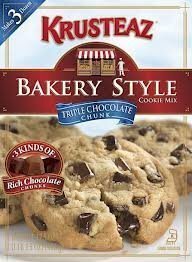 Krusteaz Bakery Style Triple Chocolate Chunk Cookie Mix makes delicious cookies. All I had to add was an egg and a stick of butter. It was so easy and the cookies turned out perfectly. They were so chocolatey and moist. I love baking chocolate chip cookies,brownies and cupcakes! the men here LOVE but LOVE chocolate chip cookies like crazy. Yes it IS their fav. I like to put in Oatmeal to try to give them some more "goodness" oats and walnuts or pecans. Try some rice krispies, ooo that adds some great crunch! I like to make chocolate chip cookies, but add extras to them. My favorite cookie to bake is chocolate chip cookies, they are the best. I love making peanut butter cookies and adding walnuts to them.Yum! I like to buy chocolate chip cookies. I like baking chocolate chip cookies because I am trying to find the "perfect" recipe. I like to bake sugar cookies. My favorite to bake are chocolate chip cookies. My favorite cookies are butter shortbread. I like to bake chocolate chip cookies. My favorite type of cookies to bake is peanut butter cookies. My favorite type of cookies are No-Bake Oatmeal Cookies! My favorite cookies to bake are soft chocolate chip, and peanut butter. Snickerdoodles is a family favorite. Chocolate chip coookies are great with milk. I like chocolate chip cookies. I like snickerdoodles and chocolate chip. I love peanut butter chocolate chip cookies! My favorite cookies to bake are chocolate chip. My favorite type of cookie to buy or bake is Snickerdoodles. My favorite to make and eat is chocolate chip cookies. I love baking vegan chocolate chip cookies with walnuts (or whatever nuts I happen to have on hand). I like to bake chocolate chip cookies, everyone loves chocolate chip cookies! classic chocolate chip is always best! My favorite cookie to bake and buy is Oatmeal Raisin.